Hello and welcome to my meme Tuesday Cuppa Tea looking toward upcoming Valentine's Day. 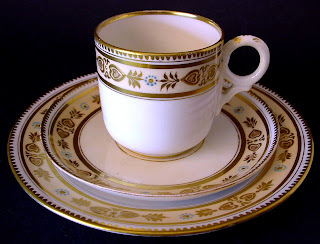 The teacup trio I am sharing today is an antique set from the Potteries region of England. The Potteries surround Stoke-on-Trent where many of the most famous English potteries flourished because of the deposits of quality clay found there in the 1600s. I found this set at an antiques faire in Worcester, England on a buying trip. 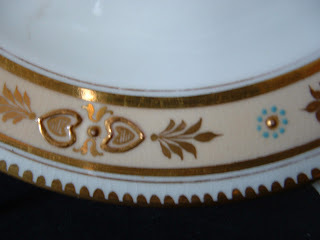 The cup and saucer with matching plate are completely hand decorated with a pale peach banding, heavy dimensional hand applied gold hearts, dentil border and dots and further turquoise enamel flowers. The phtots just don't do it justice. 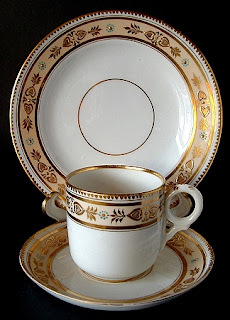 The teacup trio is unmarked which is quite normal for early Staffordshire pieces. It may be a Grainger piece...that's my best guess. I love it! I thought the hearts were appropriate for a pre-Valentine's Day theme. 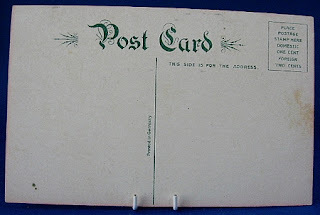 To see either the teacup trio or postcard at Antiques And Teacups, just click on the photos. 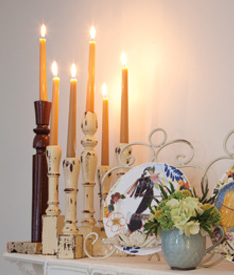 The following photos are from Country Living Magazine. 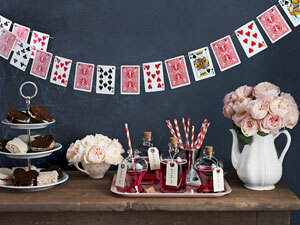 The article was called a Valentine Tea and has an Alice In Wonderland theme. So cute! 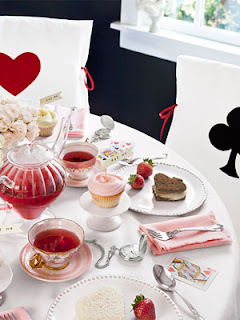 I am joining the following tea related blog parties today. Have fun visiting! 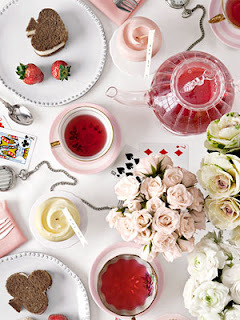 Happy Pink Saturday which I am joining hosted by How Sweet The Sound. I have a hand colored on grey transferware art deco teacup in a pattern called Sweet Pea by Roslyn England that was made in the 1930s. When I saw it an an estate sale a few weeks ago, all I could think of was Pink Saturday! Isn't it wonderful? I love the art deco shaped handle as well. These hand colored cups and saucers are wonderful as no 2 are alike. This is hand colored and the the red is hand applied enamel paint. Love it! And some of the blossoms are...Pink! I have been having a lot of allergy problems lately. A life long thing, actually, but really kicking up at the moment and I don't know why. One of my worst allergens is milk. It gives me severe asthma and hides under various names. Normally, an antihistamine works and I can eat without too much problem, but at the moment none of the usual antihistamines is working well, so I am having to make everything from scratch to make sure there are no milk products. I have a Vegan cookbook and just tried this recipe of oats, applesauce, raisins, flour sugar and cinnamon and was pleased. They are edible. Not all of the recipes I have tried are. At least I now have something to have with tea while my husband is eating the pecan shortbread I made him! Have a great day visiting and bathing yourself in pink! Literary Friday: Dalziel and Pascoe meet Jane Austen - Not For The Faint Of Heart! I love English mysteries, and I love Jane Austen...but rarely do the twain meet. But..in this book by Reginald Hill...who BTW died a few weeks ago....called The Price Of Butcher's Meat it happened with a smash. I used to read the early Andy Dalziel and Peter Pascoe novels maybe 20 years ago before Reginald Hill decided to be trendy and go heavily into profanity...and so I quit. But my husband...who has a less sensitive reading constitution pushed this book my way a week ago when I was out with a cold and out of books to read. At the foreward I was caught...and flinched my way through it. Have you read Sanditon by Jane Austen? An unfinished novel that was finished by Marie Dobbs in 1975 which I quite enjoyed. Well, instead of Sanditon, the Hill novel takes place in Sandytown. The accident bring Tom and Mary Parker together with the Heywood family through a carriage accident becomes an ATV crashing into a ditch or, as he calls it, tank trap, set by farmer Heywood to keep folks from scaring the animals and trespassing. Charlotte becomes Charley who tells much of the story through emails sent to he doctor sister who is on a medical mission to Africa. Most of the characters remain recognizable. Sidney Parker, however, is no longer the hero for Charley, but has a different kind of relationship with Sir Edward. And, unlike the other Sanditon, there are dead bodies littering the scene. Plop down raunchy Fat Andy Dalziel to recover from a terrorist bomb in an expensive hoistic convalescent hospital in Sandytown with all the characters and you have a wierd but enjoyable novel with large doses of Jane Austen...if you can get over the profanity and rather skewed Hill outlook on life from a rugger's viewpoint. So...Jane would be recognizing certain things but appalled at others. But...an interesting read, especially if you have a tough stomach and are familiar with Sanditon. Did I mention that Diana Parker's friend is an animal right activist....and Lady Dapne is a nymphomaniac? You get the picture. Jane, where are you???? 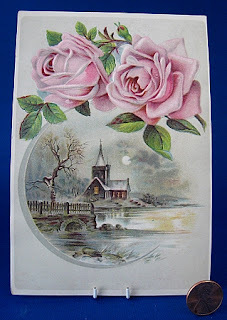 I am joining Teacup Thursday with Miss Spenser and Vintage Thingie Thursday with Coloradolady today. 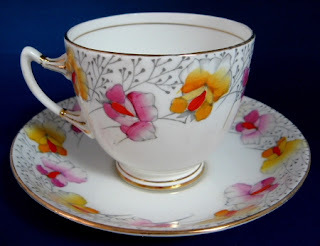 This is a 1940s vintage Royal Grafton, England cup and saucer that I just love. I love the combination of the gold overlay chintz and the hunter green bands and floral bouquet centers. Tea would just taste better, don't you think? 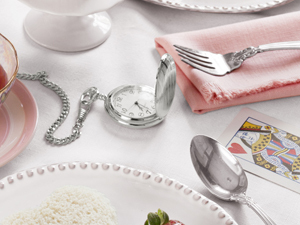 Royal Grafton has always been a favorite of mine through several incarnations and always has made wonderful designs. 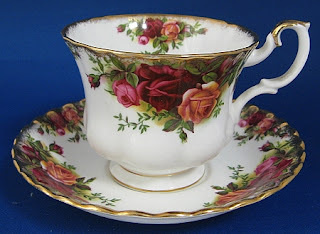 To see more of the teacup at Antiques And Teacups, click on the photos. After all the snow we had last week it was nice to get out the last few days and see the big world. It makes us understand the nesting instinct we have to make our homes as welcoming and inviting as possible. 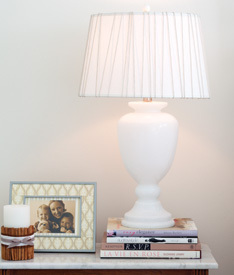 A simple white palette with family photos and beloved books. Candles and pastel accents against white walls. 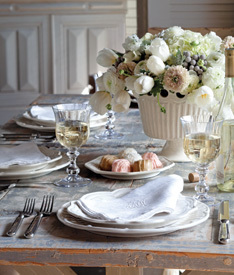 A table set with a pale palette welcoming us to a tea with friends. 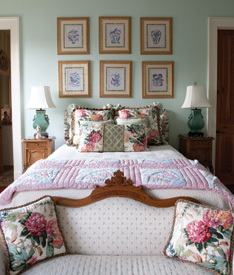 Pastel colors and fabrics with complementary hues to soothe and relax. 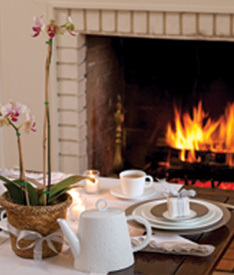 An intimate tea before the fireplace promising a tete a tete in a relaxed mood. I hope your day is as relaxed and pleasant, and full of friendship and tea as you could wish! I don't know how many of you are familiar with Sunset Magazine. I was born about 1 1/2 miles from Sunset and it has always been a part of my life from visits to a whole lot of recipes I use. A Western magazine to be sure, but regional now as well. Because the magazine specializes in lifestyle, gardening, food and travel, I was surprised to see a full page add for a needlepoint company called Ehrman Tapestry advertising needlepoint kits. I do cross stitch, not needlepoint, although at one point (no pun intended) I did needlepoint a chair cover for an antique chair I inherited many years ago. But in the ad is a wonderful needlepoint kit for a design called Teatime featuring teacups. 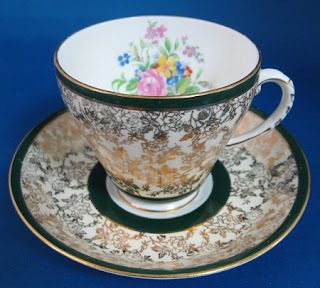 The central is a Shelley China teacup in the Queen Anne shape. That is so cool! So thought I'd post it in case anyone is interested or is looking for a tea related project. The cup cake pillow is pretty cute as well! Sunset also surprised me with a few pages of tea related things which I will be sharing in the next few posts. We are off in the rain to a Parkinson's Disease monthly support group today, after which we have a lunch out and hit the antique/thrift shops in case we find something we can't do without. We chinwag with a local dealer pal at his shop The Mouse Trap in Port Angeles, and generally have a neat wander-around day. Hope yours is as much fun! Welcome to Tuesday Cuppa Tea! 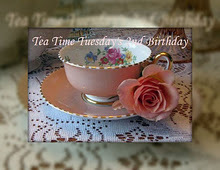 Today I am also joining Sandi of Rose Chintz Cottage for the 2nd Birthday of Tea Time Tuesday! Congratulations Sandi! Also the wonderful other blog parties at the end of the post. 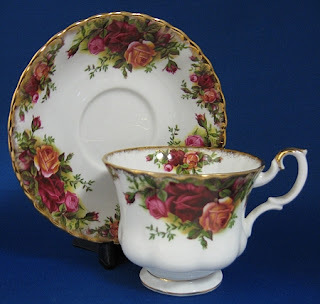 Roses are the theme, so here is my personal formal china with roses, Royal Doulton's Rosebud from the 1940s. Not the hand painted periwinkles that Hyacinth Bucket favors, but I love it. 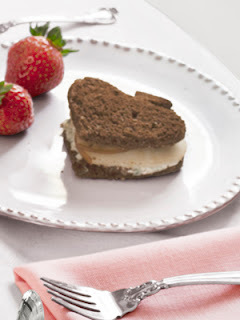 This was my teatime today with pecan shortbread and Twinings Darjeeling tea. I won't be favoring Twinings much in the future as I found out they moved their te production from England to Poland and China in Sept. 2011...very quietly, no fanfare, just laid off the workers and moved. So I will be switching tea companies and take my business elsewhere. 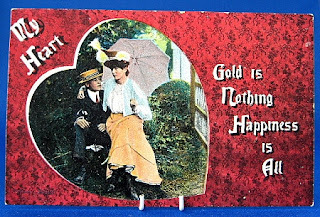 Album cards were made during the Victorian and Edwardian era to be placed in the scrap albums that were a parlor activity of genteel ladies. They could be purchased cheaply and were considered to be edifying and educational, training ladies in beauty, sentiment and taste. 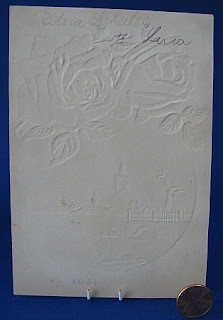 This pretty album card measures 6 inches high by 4.25 inches wide and is embossed, and has a vignette...which you probably know I love...of a church in the moonlight by the river. Charming. It was probably a gift as it bears a penciled name on the back. I love the roses! 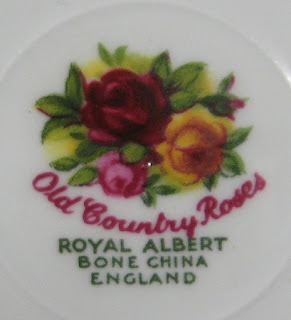 And one of the most famous rose patterned cups and saucers...Royal Albert Old Country Roses...made in England...which they haven't been since 1992...sigh....For more album cards, Victorian ephemera or the teacup at Antiques And Teacups, click on the photos. 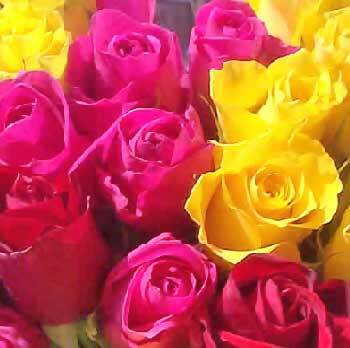 A bouquet of roses for Sandi's birthday! For you fans of Downton Abbey who like a more documentary, scholarly approach to what living in an English Edwardian stately home was like, PBS airs Secrets Of The Manor House tonight on PBS. On our PBS it is at 7pm just prior to last week's episode which is aired just before tonight's episode. It looks very interesting. The Edwardian era, named for the time Edward VII was king after the death of Queen Victoria in 1901 and stretching to the crowning of George V in 1910 is an era that is fascinating for it being so transitional on so many levels in English society, affecting the home, economy, government and individual right. I love the insights. Watch Secrets of the Manor House - Preview on PBS. See more from Secrets of the Manor House. Well I am finally back feeling a bit better and posting...somewhat...again. I am joining Pink Saturday with Beverly at How Sweet The Sound. This is my pink! 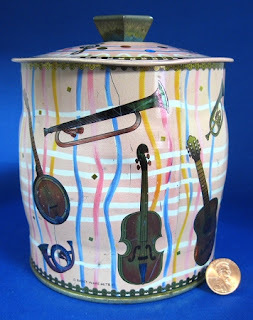 A vintage English tea tin with a design of musical instruments on a sort of retro pink, blue and white loose plaid. I love tea tins...and have a row of them in the kitchen with various types of tea. Especially as my husband prefers different types so we have lots of tea in the house! Tea tins can be used for all sorts of storage...not just tea. They are just so versatile! 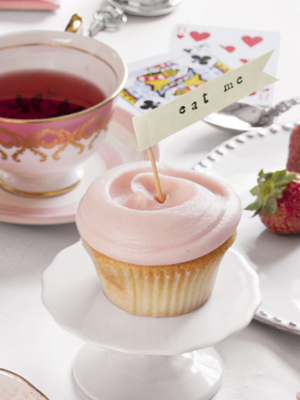 I am going to enjoy the Pink Saturday posts...missed last week with illness, so will enjoy it doubly! The snow here is thawing a bit and we now have icicles hanging from the roof. I haven't been out of the house since Tuesday, but hope to get out tomorrow...hopefully the roads will have thawed. 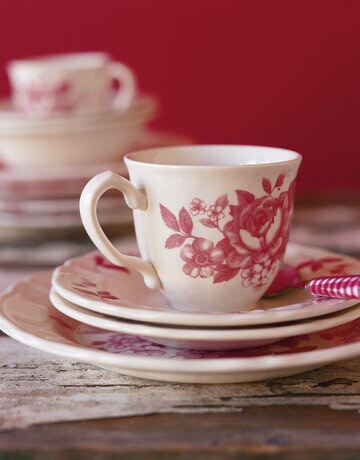 Have a wonderful, warm and Pink Saturday! For more on the tea tin at Antiques And Teacups, click on the photos.